European spined loach Cobitis taenia, from here. 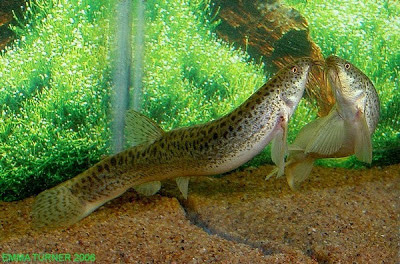 The spined loaches of the Cobitidae are a family of small freshwater fishes found across Eurasia, with a single species (Cobitis maroccana) making it to the northern tip of Africa. A recent catalogue of the family by Kottelat (2012) recognised twenty-one genera in the families, though phylogenetic studies suggest that some reshuffling may be necessary: the Chinese Paramisgurnus dabryanus, for instance, may be nested within the genus Misgurnus, while the Sino-Japanese genus Niwaella may be a polyphyletic grouping of elongate species adapted to fast-flowing mountain streams (Šlechtová et al. 2008). Eel loach Pangio anguillaris, photographed by Thomas Frank. As a whole, loaches are more or less worm-like fishes that feed by benthic scavenging. Most species are small, less than ten centimetres long, though the Thai Acantopsis spectabilis gets up to around 15 centimetres (Kottelat 2012), and the weather fish Misgurnus anguillicaudatus reaches about 25 cm. Phylogenetically, the family was divided by Šlechtová et al. (2007) into two groups, a 'northern clade' containing the northern Eurasian species in the genera Cobitis, Misgurnus and related taxa, and a paraphyletic 'southern group' containing the remaining southern and south-east Asian species. The ranges of the northern and southern subdivisions overlap in northern Vietnem, but otherwise the two groups are geographically disjunct. A potential morphological synapomorphy of the northern clade is a horizontal ossified structure, called the 'scale of Canestrini', on the second ray of the male's pectoral fin, but if so this character has been lost in some subtaxa such as the western Eurasian genus Sabanejewia. Weather fish Misgurnus anguillicaudatus, photographed by Emma Turner. One interesting detail about the northern spined loaches is the existence in various localities of natural polyploid populations: such polyploids have been identified among European Cobitis species, and in the Japanese Misgurnus anguillicaudatus. These mostly triploid (sometimes tetraploid) populations of loaches reproduce clonally, but are always found in association with a sexually-reproducing diploid population. This is because the parthenogenetic females are what is referred to as 'sperm parasites'. The parthenogenetic females still mate with sexual males, not to be fertilised but in order that the act of mating will stimulate egg production. In external appearance, these polyploids are generally indistinguishable from their co-existing diploid associates. European polyploid Cobitis are believed to have arisen through hybridisation between closely related sexual species, possibly through male sperm fertilising an unreduced diploid egg. Protocobitis typhlops, from Kottelat (2012). Oh yes, and there are cave-dwelling loaches out there: two Chinese species, placed in the genus Protocobitis, are blind species collected from groundwater. How they relate to the above-ground species remains unknown. Šlechtová, V., J. Bohlen & A. Perdices. 2008. Molecular phylogeny of the freshwater fish family Cobitidae (Cypriniformes: Teleostei): delimitation of genera, mitochondrial introgression and evolution of sexual dimorphism. Molecular Phylogenetics and Evolution 47: 812-831. Kottelat, M. 2012. Conspectus cobitidum: an inventory of the loaches of the world (Teleostei: Cypriniformes: Cobitoidei). Raffles Bulletin of Zoology, Supplement 26: 1-199.